Show the back of the product – this is something that retailers don’t often do but can help answer shoppers’ queries about a product, such as showing the type of connections and number of scart sockets on the back of a TV or DVR, or showing whether a suit jacket has vents on the back. These features can be explained in the product description, but a picture gets these points across to customers instantly. The same principles apply to showing products from the bottom or the sides. Show how large a product is – showing items alongside objects of known size or on models will help customers to see how big products are. Showing them in context can also ease customers’ worries about how a product will look once they receive it. The GetElastic blog has some excellent examples of showing products in context here. Use professional quality images – this is basic advice but absolutely essential if you want customers to get a real feel for the products. Also, poor quality, low resolution photos can make your site look less professional. For some products, clothes and shoes particularly, you can’t expect customers to make a decision to purchase based on one simple photo; they have to be able to see the detail. Showing products in context, as well as giving users an idea of scale, can answer customers’ questions about how a product works, how it will look on them etc. This is one area where video could be useful, but Firebox does a good job of showing shoppers what the ‘slanket’ (some kind of blanket with arms) does. More retailers are now using video and, with some products, video is more useful than photography as it can display a product in motion or from a variety of angles, or with sound. For some products only video will do. For example, with this baby ‘travel system’ on Mothercare, the video can show how it folds up, and the range of different seating positions it can be adjusted to, something that could not be achieved without a lot of product images. See this post for more examples of retailers using video. Why do major publishers prevent Google from caching? 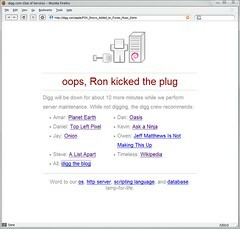 A website I run is undergoing a makeover and is down for the day, and I wanted to show somebody the old version. As such I aimed for the Google cache, which is useful in this sort of situation. I noticed that the cache had updated in the early hours of the morning, and as such I couldn’t see our old site. Bugger.